I recently blogged about this one and the method I used to make it. Every print is from designer Anna Maria Horner. Some new, some old, some VERY old. Everyone loved and precious to me! 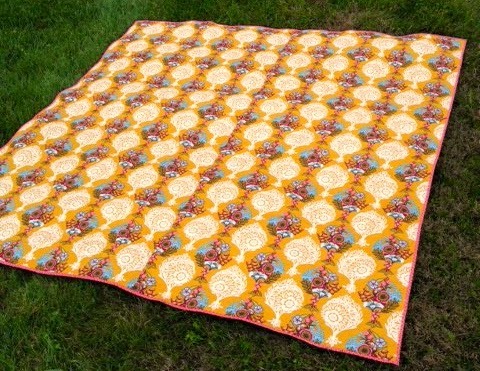 I got it all quilted up and ready to ship to its new home---and, yes, that means I'm not keeping it! It's a shocker I know, but I do have, uh, several other Anna Maria Horner quilts to keep me warm! I used my favorite Innocent Crush print for the backing on this one and I couldn't be happier with the results, even though it was a case of using what I had on hand! It's ones of the BEST feelings to find enough yardage for backing in my stash! Before it was quilted this quilt made a nice curtain in my living room! My husband thought it was a bit too much to stay there permanently. Oh well! Look how pretty it looked with the light coming through! 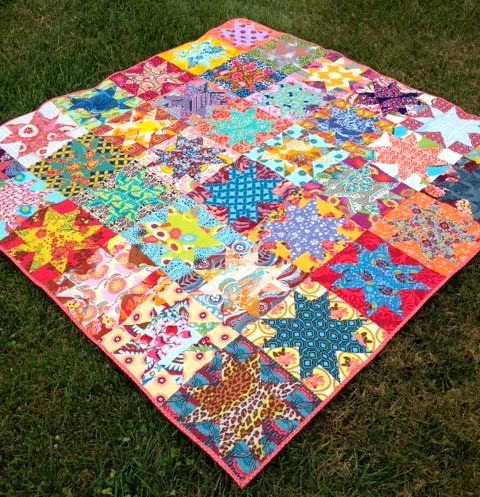 What a fun and cheery quilt! All those AMH fabrics make for a really rich and luscious quilt! So beautiful. I love the photo with the light shining through. It looks like stained glass! I love love love this one! Big surprise right? That backing is my (current) all time favorite AMH print! Nice work! Stunning...I love the riot of color. it's so bright and beautiful! I couldn't bear to give it away! Such a beautiful quilt! I love all those colors. You are my kind of girl! 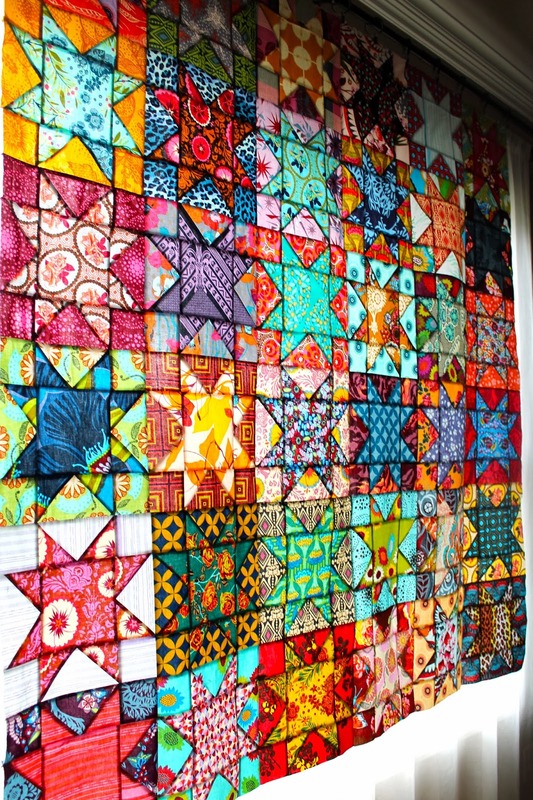 This is one of my favorite quilts I have seen recently! Love AMH! That´s a cool quilt. Love the scrappy Feeling of it! It's fab, hope you at least retain visiting rights! Husbands *sigh* they just don't get it, do they ;) It's a beautiful quilt - the fabrics are amazing. It's gorgeous. That block is one of my favorites, love all the color you used.